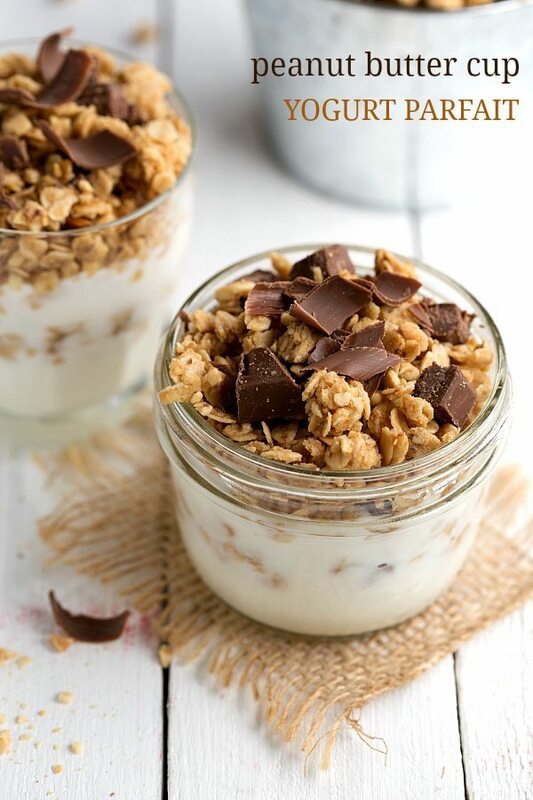 The tastiest peanut butter cup granola mixed into a creamy and delicious yogurt parfait. 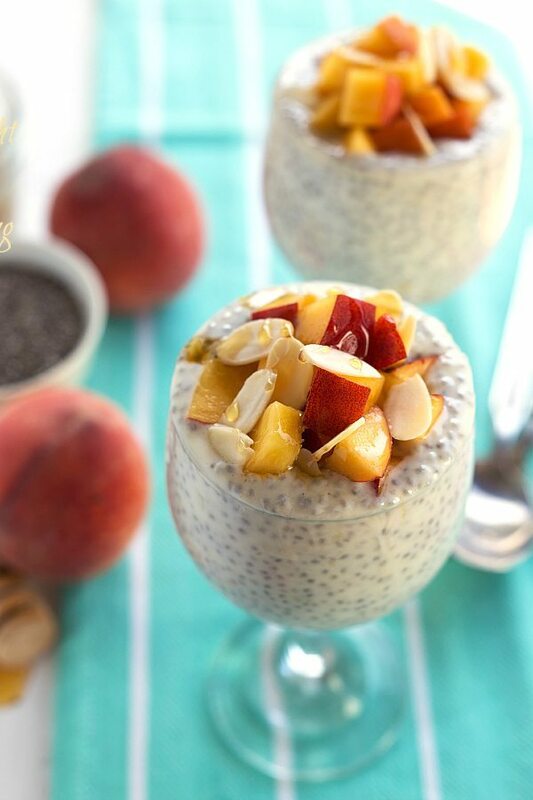 A healthy and flavorful breakfast that can easily be taken on-the-go. It’s time we talk about one of my favorite people ever which would be my father-in-law. The first time I ever met him I was on my second date with my now husband. My (now) husband had gone home from college for the weekend. I happened to be pretty close to his parent’s home so he invited me over to see a movie at his home. When I came into their house (after obviously driving around lost for close to an hour because that’s just how I do things), he introduced me to his parents and guess what his dad did? He came right over and gave me a big hug. He gives some of the best hugs by the way. Anyways I thought that was the cutest thing ever and instantly fell in love with his parents. Which is a good thing since they are my parents kind of now too. So you may be wondering why I’m telling you gushy dating stories or introducing my father-in-law here on the blog? Well the reason is this recipe is all his idea. While I doubt my creativity to come up with an entire week’s worth of parfaits that aren’t the same thing (yogurt, granola, and fruit), I am very excited to share this one. And of course dedicate it to my father-in-law so I can finally tell him I put a yogurt parfait on my blog. All credit to him of course. 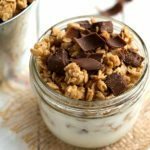 Mix some of that creamy delicious yogurt with this crunchy and tasty (plus super easy) peanut butter cup granola and you’ve got one heck of a delicious breakfast parfait! In a large bowl, combine the peanut butter, honey, coconut oil (measure when softened), and brown sugar. Microwave for 20 seconds and stir until well combined. Microwave an additional 20 seconds if needed to get to a stir-able consistency. Stir in the oats, finely chopped peanuts (I bought a bag of already chopped peanuts). vanilla extract, and salt. Bake for 10 minutes, flip and stir everything around, another 10 minutes, flip and stir everything around, and another 5-10 minutes or until lightly golden brown. Remove and allow to cool until firmed/hardened into granola. Stir in the chocolate once the granola is completely cool. Spread the vanilla bean yogurt evenly among the bottom of parfait dishes. 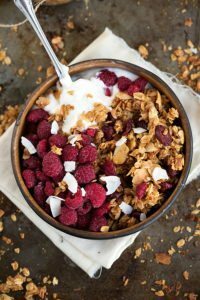 Place a layer of the baked and cool granola, another layer of the yogurt, and another layer of the granola. Continue layering to desired preference and top the parfait with chocolate curls if desired. Sounds like you have a wonderful father-in-law, Chelsea! And I love his idea of yogurt parfaits! These look amazing! Anytime I can eat peanut butter for breakfast is sure to be the best meal of the day. Love these little parfaits, too…so cute! Pinned! I could totally got for a week of parfaits, especially if they’re as delicious as this one! You’re father in law sounds wonderful, Chelsea! His idea of yogurt parfaits is wonderful and very fitting for your blog. Tell him, “Great job!” I love the peanut butter in these. Wish I had one right now! Pinning! 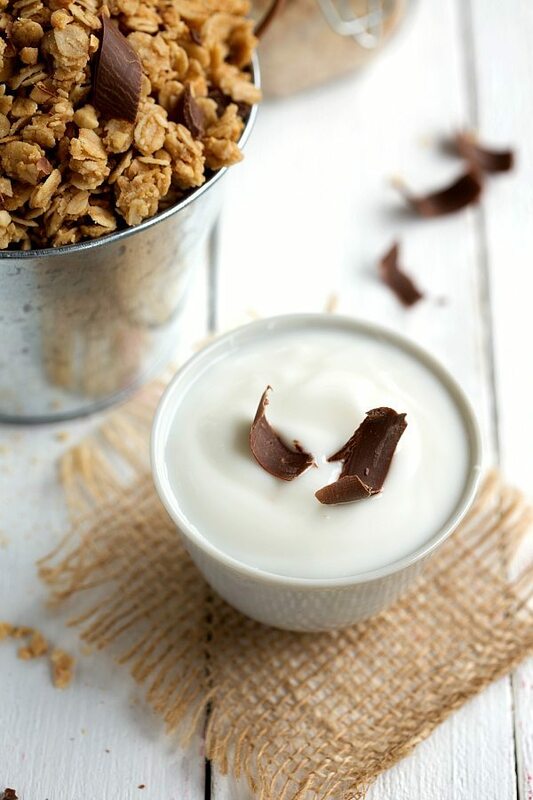 Both the granola itself and yogurt parfait sound great and very delicious! Love your father in law’s idea 🙂 Pinning! Oh Chels these look so yummy! Mark is going to be thrilled that you made them! This sounds so incredibly fabulous. I am a huge fan of peanut butter and chocolate together and well, if I can eat those two things for breakfast then I’m definitely on board. Sounds like you have a wonderful father-in-law just like me. I also love my father-in-law and always asks how my blog is doing too. He even helped me to make a wood board to take my photos 🙂 I love your father-in-law idea. This parfait looks just perfect. These parfaits are seriously amazing! 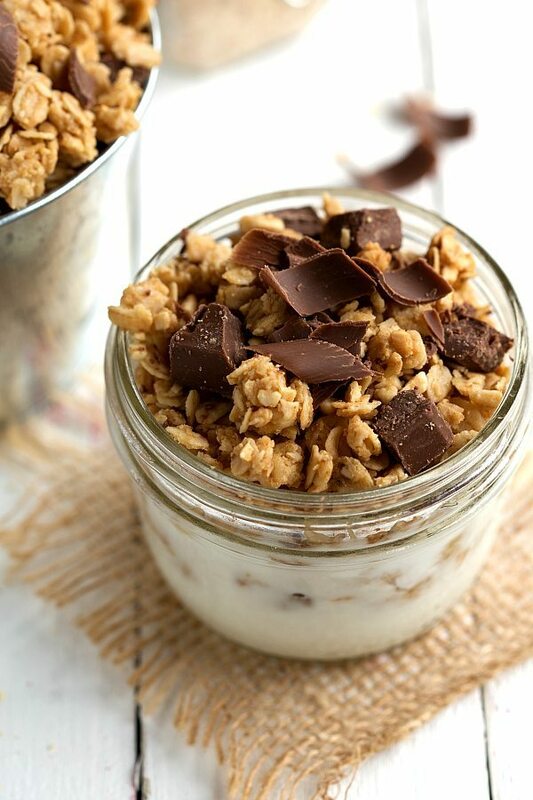 I’ve got to make some of that peanut butter cup granola, and pairing it with Greek yogurt in a parfait is such a great idea. Your father-in-law is a very smart man. 🙂 Your photos are gorgeous, as always! Awwwww your father-in-law sounds ADORABLE! My boyfriend, Kyle’s, dad is like that too. We’ve been dating for over four years now, but I also fell in love with his family at first hug. And on the note of deliciousness, this looks amazing! Pinned! Your father-in-law sounds so adorable and that’s awesome that he shows interest in your blog 🙂 Love his parfait ideas, these look amazing! Your father in law sounds like the sweetest man! I’m so glad he inspired you to make these amazing parfaits! I love everything about them! Why don’t I eat more breakfasts like these?? Seriously, I need to get with it! Looks delish girly. Betty Crochet – ha I love that! And what a great idea he had! These parfaits look absolutely delicious! Well I know what my next dessert is going to be! 😉 Looks awesome! Peanut butter and chocolate might be the best flavor combination. Ever. And when mixed with granola? I’m dying, because I can totally justify this as breakfast. Your father-in-law was definitely on to something with his suggestion 🙂 Pinned! So glad I follow you on insta! Saw this post and got pumped 🙂 Looks great! This story is so sweet, Chelsea! & your granola is making my granola cry 😉 Yours looks amazing and definitely takes things up a notch! Aww, that’s just the sweetest thing!! I want to meet your father-in-law! Betty Crochet — too cute. 🙂 I bet he wishes he could’ve been your official taste tester for this recipe. It looks fabulous, as always! Pinned! This sounds AmaZing! However, where do the chocolate chips come in? I think I’m adding this to my weekend breakfast list! YuM!